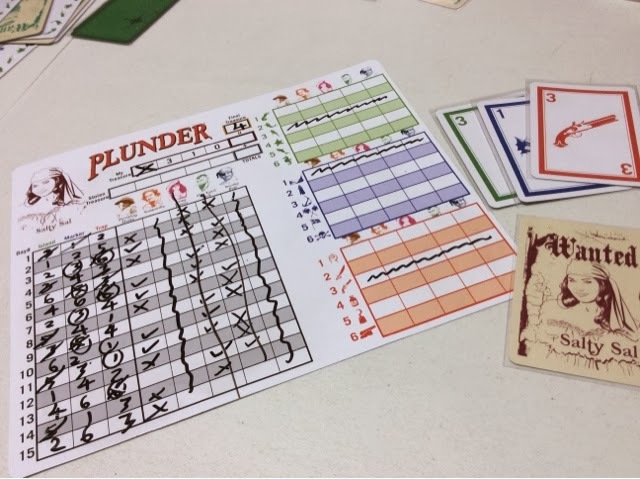 Plunder is a quick playing and easy to pick up deduction game. Each player is given 3 cards, 1 of each color - Red, Blue and Green. Each of these 3 cards is represented by a number from 1-6 ( no player will hold a card of same color and number as another player ). The 3 cards in your possession are what your opponents are trying to guess correctly, and likewise you are trying to guess the 3 cards in the possession of each of your opponents. The game plays a maximum of 15 rounds after which all the guesses made by the players will be revealed to see who has gotten the most points, and that person will be declared the winner of the game. During each round, 1 card of each color is flipped face-up on the table. The cards will likewise be numbered from 1-6 and each number is represented thrice in the deck of cards. Going round the table from the start player, all other players will simply declare "Aye" or "Nay", which is their way of saying if any of the 3 face-up cards on the table match at least 1 card in their possession. The start player will then change and this process is repeated till 15 rounds are up or till everyone has submitted all their guesses. If you are the start player, you have the option to change one of the face-up cards by flipping another card from the deck to replace that card. And that's pretty much it. Guesses can be made anytime and once done will be thrown into a treasure box in the middle of the table. The order of the guesses are important because the player who guesses correctly the cards in another player's possession first will score more points compared to the player who made the correct guess much later in the game. If by end game, you were able to evade the guesses from the other players, you will score bonus points to add to your total from your correct guesses. So, why is this not a game ? Well, the biggest reason for me is that the scoring system is just completely bonkers. You actually get the most points from evading the guesses of the others ( if no one succeeds in guessing your 3 card combination, you get a whopping 6 points ) rather than making correct guesses of your opponents' cards ( a correct guess yields 3 points if you are the first player to get it right, 2 for the second, and 1 for the third ). In and of itself that is not a bad way to score points, but the fact is, you have no control whatsoever nor avenue to bluff or maneuver yourself in a way to stop people from guessing your cards. So why bother to offer points for something that you cannot control ? Combined with the fact that, through lucky card draws, others may never have a high percentage chance to guess your cards, then you will have pocketed a free 6 points just for doing absolutely nothing. The way the cards come out, there is a chance that a player's cards cannot be sufficiently deduced and thus a lucky guess has to be made ( albeit it is likely a 50-50 guess ), but that would mean that that player will possibly finish with a free 3 points out of 6 whereas the others may end up with 0 if everyone made good on their guesses. And all this happens without any effort from that player. Just straight out good luck. It would have been better if they only rewarded points for correct guesses. That's all. Then whoever made the most number of correct guesses at the fastest possible time will be a winner. Then we have a game people. So yes, its not really a game because you just simply can't play to win. You may have made the most correct guesses, but someone who didn't get his combination figured out and maybe made just one correct guess could still outgun you for the prize. That makes a deduction game simply and utterly meaningless. My First Game - I obviously did not use the chart offered to me on the right hand side correctly. What a Mess. OK, with that out of the way, Plunder is a fun activity. It is. Its hard to deduce properly when you have people rushing you. But still, that meant the game was over quickly and won or lost we could always do it again. 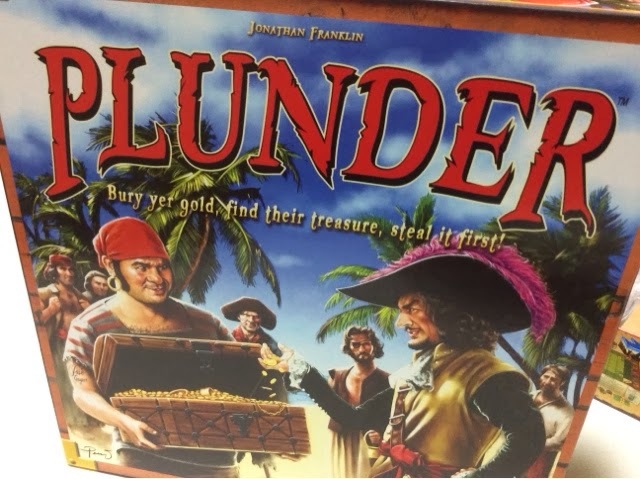 I will say that if you took it as a fun activity to do with others, then Plunder will be a great choice to lull away a good 30mins or so. Everyone will be thoroughly engaged throughout and the game may soon be over before you know it. The puzzling aspect is fun and the race to be first extremely tense. Just don't attempt to play to win. You may not even win even if you were the best at the game of deduction. The scoring really takes the game multiple steps backwards. Of the 2 games I played, I actually scored more points when I didn't get anybody's combinations correct than when I got 1 player's combination correct. I guessed correctly and I did worse than when I didn't guess right? What an epic fail. You could still treat this as a game though, if you simply played it by giving out points for correct guesses and ignoring the silly points for evading nonsense. In any case, the gameplay is fun and that's all that really matters.